Guntram Kaiser is founder and CEO of the international communication agency KaiserCommunication GmbH (Germany). 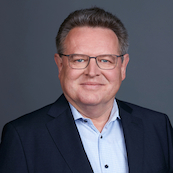 Guntram has more than 25 years of experience in international Public Relations and Strategy Consulting, Crisis Communication and Issue Management for his clients in Germany, Russia, Asia and other parts of the world. In the 1990s he was Managing Director with the international PR agency Weber Shandwick in Bonn and Berlin. Among his clients were HEWLETT Packard, the Ministry of Foreign Affairs of the Cyprus Republic, the German Federal Ministry of Economics, Siemens, the Industrial Development Board for Northern Ireland and many others. In 2003 he founded his own communication agency KaiserCommunication GmbH in Berlin. Guntram is a member of the Russian Association of Public Relations (Raso). In 2014 he was a jury member of the Russian PR award Serebrjany Luchnik in the category global communication. Guntram Kaiser is a guest lecturer in Public Relations, Intercultural Management and Business Management at the Business School of the Moscow State Lomonosov University, The Moscow State Linguistic University and the Berlin based EBC College. He is author of a large number of articles about Public Relations in German and Russian books and magazines. Guntram is Chairman of the Public Diplomacy Initiativkreis e.V., which is an independent initiative with the aim to foster tolerance and international understanding on all cultural levels. Guntram is graduate from the Moscow State Institute for International Relations (MGIMO, 1985). He is fluent in German, English and Russian.